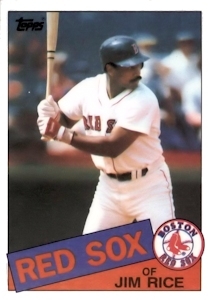 ON THIS DAY (June 10, 1985) ... On their last chance of the evening, the Sox parlayed fantasy, fortune and ferocious determination into a three-run rally: specifically, a three-run Jim Rice homer into the screen that gave them a 4-2 victory, ran their winning streak to eight games, extended their overall surge to 11-1 and pulled them into a third-place tie, 6 1/2 games behind front-running Toronto. The first eight innings of this latest chapter in Red Sox resourcefulness were implausible; the climax bordered on the impossible. It began with a single to the opposite field by Wade Boggs. It proceeded with a would-be sacrifice bunt by Bill Buckner that was headed into foul territory before it struck a kind-hearted pebble and wound up as a single. And it ended with Rice's blast, which came after the Boston strongman had twice failed to lay down his first sacrifice in five years. For eight innings, this match was the equivalent of the heavyweight boxing championship being determined with a game of patty-cake. Two teams that had been tattooing AL pitching, suddenly saw their bats turned into stumps by a pair of left-handers with the wind blowing out at Fenway, no less. The Brewers had packed a bit more wallop as Cecil Cooper's two-run third inning homer overshadowed Glenn Hoffman's second-inning solo shot and gave Milwaukee a 2-1 lead. It appeared that would be the extent of the offense. And it appeared Bob Ojeda would be cursed. In his third start since returning from the bullpen to the rotation, Ojeda (4-1) was masterful, limiting the Brewers to seven hits and retiring 18 of the 20 batters he faced after Cooper's bomb into the center-field bleachers. But Ojeda seemed destined to see both his earned-run average (now 2.25) and won-lost record lowered, because his counterpart, Milwaukee rookie Teddy Higuera, had stifled the Sox on three hits and had set down 20 of the 21 batters he faced after Hoffman's homer. Boggs ended Higuera's spellbinding stretch with a leadoff single to left. Then came Buckner's carom shot. At that point, with runners on first and second, Brewer interim manager Frank Howard hauled Higuera off the mound, sending in relief ace Rollie Fingers to face Rice. Meanwhile, Rice, who was in the cleanup spot despite a scratched left cornea that had forced him out of Sunday's game, was being assigned to perform the unimaginable: sacrifice. Rice's best didn't quite pan out. He fouled his first bunt attempt down the third-base line. His second bid went skimming toward first, but it had originally struck his foot for strike two, meaning that the sacrifice experiment now had to be scrapped. After two more pitches, Rice sent the into the screen, and the Red Sox into third place.